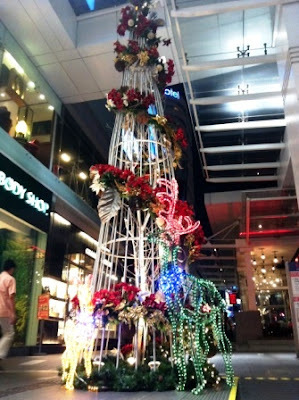 Fahrenheit88 Celebrates A Traditional Christmas with Santa, Carolers, Blossoming Poinsettias, Christmas Bazzar and etc… Be prepared to be swept into a captivating splendor as you step into a lush Christmas garden and experience the sheer joy of shopping at Fahrenheit88 this festive season celebrates “A Traditional Christmas” from 15 November 2011 till 1 January 2012. 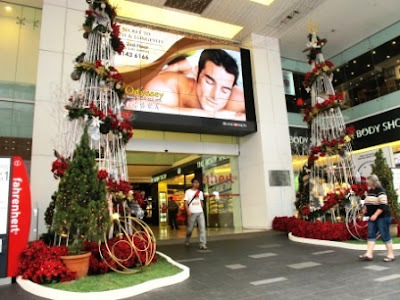 Fahrenheit88 is enveloped in a lush sea of green as the mall is decorated from the main entrance with enchanting light curtains from the ceiling that sets to draw attention, blossoming poinsettia gardens, potted conifers adorned with twinkling lights, colorfully lit reindeers, giant baubles and five units of 20-feet modern Christmas tree enwrapped with Christmas garlands in a delightful mixture of red, gold and silver. 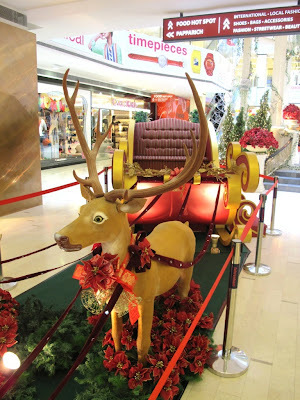 Ushering in the festive mood upon entering the mall, shoppers will be greeted with the wonderful sight of life-sized reindeers pulling on Santa’s sleigh, the perfect spot to capture the Christmas celebration as shoppers can expect to see Santa and Santarina appearing during the weekends! 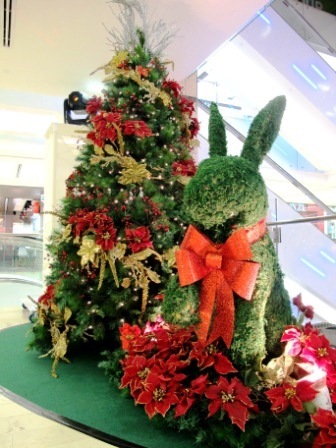 Shoppers can take photographs with Santa and receive an early mysterious Christmas gift. Moving along into the Atrium, a magnificent 30-feet gazebo takes centre stage with ferns draping, romantic chandeliers, whimsical bird cages and lush red poinsettias creating a pleasantly cozy setting for a traditional Christmas where shoppers will be serenaded by our Christmas Stroller Band and carolers. 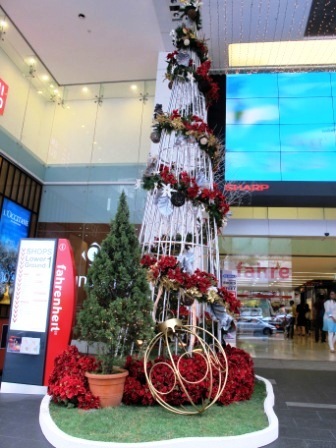 The Concourse is a buzz of school holiday and festive shopping excitement offering Christmas trims, gift ideas, home décor and much more. Serenade to the joyful hymns of Christmas. Come meet Santa & Santarina on his sleigh for a photo and receive a mysterious gift. 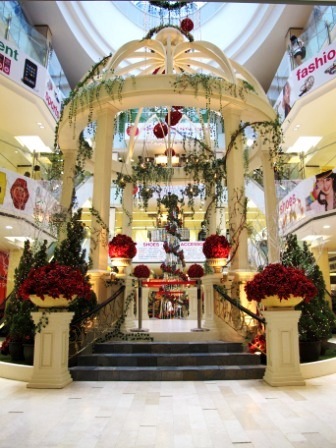 Indulge in festive tunes by our Christmas stroller band around the mall. Free Christmas wristlet when you charge RM300 in a single receipt to your MasterCard. *Limited to 1 redemption per shopper per day only. Be one of the five lucky winners to have hi-tea on TV with a celebrity. Get 1 form with every RM300 charged in a single receipt to your MasterCard. *Maximum 5 forms per redemption per shopper per day only. *Redemption and contest forms at Concierge Counter, Ground Floor. *Valid while stocks last and other terms and conditions apply. Bag an instant gift when you spend RM100 at any specialty stores or RM300 at UNIQLO. When you spend RM100 at any specialty stores or RM300 at UNIQLO. 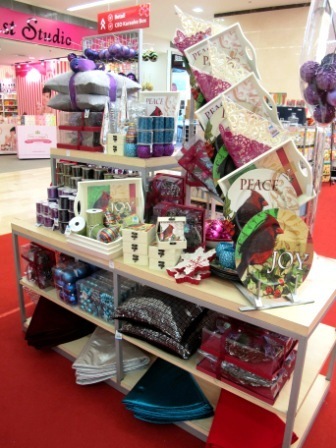 Shop for the perfect festive trims, gifts, decorative ideas and school holiday specials at Concourse, Ground Floor. Get inspirations and enjoy festive discounts on home decor and bedding items at Lower Ground 1. Dress for the season and enjoy up to 80% OFF branded fashion items at Event Hall, Lower Ground 1. Spread the joy and love of the season by donating a gift of your choice to children from Sanctuary Care Centre, Rumah Sayangan, Precious Childrens Home and Rainbow Home. 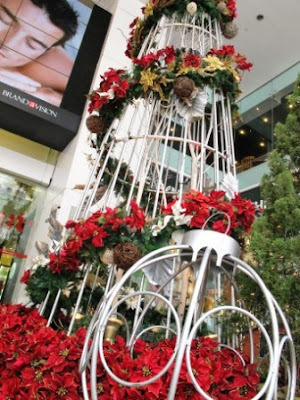 Drop your gifts at the Fly FM Christmas Tree at Atrium, Ground Floor. Enjoy great discounts, offers and promotions at participating tenants’ outlets. • Get up to 70% off at Bloop Beauty Bar, Leather Avenue & Poxzl. • Get up to 50% off at Heart Attack, Material, New Balance, Pro-Eyes Studio and Stardust Studio. • Get up to 30% off at Catch Up and My Diamond. • Get up to 25% off at Yves Rocher. • Get up to 20% off at California Pizza Kitchen and Discreet. • Get up to 10% off at Folli Follie and Fun Tee. • Receive Free Gift with Purchase at Bloop Beauty Bar, EpiCentre, Focus Point, Folli Follie, G-Factory, love g, Mircoz, Nature Republic and Pacific Coffee Company. • Enjoy Special Deals at Bloop Beauty Bar, BeeBee Nail, Folli Follie, G-Factory, My Lamb, Nature Republic and Pro-Eyes Studio. *Promotions are subject to terms and conditions as stipulated by participating outlets and valid while stocks last only. Nice decorations! I usually only go to F88 when I'm at Pavilion.